A general overview on Cuisinart CGG 180T portable grill is followed by a list of specifications describing the grill. Furthermore, a section is dedicated to discussing some of the advantages this grill has to offer, as well as possible issues to keep in mind. Finally, the review examines what other online reviews have to say and offers helpful suggestions. Grilling can be easy when camping or traveling with the proper equipment. The Cuisinart CGG 180T is purpose-built for users who want to grill on the move. This article will take a closer look at this unit in order to highlight useful features. This grill was built with portability as a major consideration. The weight and compact design are ideal features that allow a single person to move the grill with the aid of a suitcase-style carry handle. On top of that, telescopic legs offer options for setting the grill up based on the current location and needs of the user. This portable uses liquid propane canisters to supply fuel. Not only that, but it can also connect to larger liquid propane tanks with the proper accessories. A single stainless steel burner provides heat across 145 square inches of grilling space. This should prove to be plenty of cooking surface for two or even three individuals. All in all, this grill is meant to be used on the road and should be a good fit for campers and RV travelers alike. It may also prove useful for smaller family gatherings at parks or along the shore of a lake. The Grill Can Be Used Almost Anywhere: The compact size and lightweight allows this unit to be taken anywhere, including hiking and remote camping. Its legs can be set so that the grill sits on the ground, rock, table or tailgate. Those same legs can be extended to provide a cooking surface height of 29.5 inches or 74.93 centimeters. Moreover, the stabilization foot pads are designed to provide a stable cooking surface. 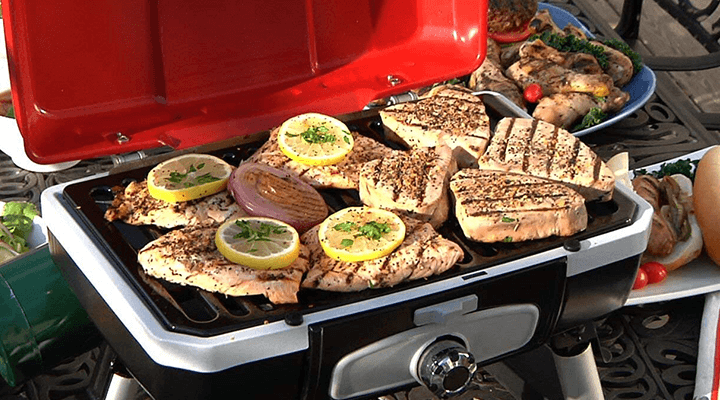 This Grill Is Easy to Use: The propane tank adaptor allows for quick fuel connection, and a briefcase style handle allows the user to carry and open the grill easily. Its fuel dial is located on the front and turns on with little effort. At the same time, its telescoping legs of the Cuisinart CGG 180T are kept in place with vertical locking levers. This product’s grate is porcelain coated, which speeds up cleaning after use. It Provides a Well Heated Cooking Surface: The Cuisinart CGG 180T provides 5,500 BTUs through its stainless steel burner. Not only that, but it also distributes the generated heat evenly across the entire grate. Its grate is uniformly spaced, offering optimum heat dispersal and searing marks on the meat’s surface. This portable grill uses liquid propane for fuel and can reach up to 500 degrees Fahrenheit across the surface in minutes. Potential Things to Look out for: The metals used for the body are selected for their lightweight and will wear over time. Also, the legs are made of aluminum and could be damaged if misused during carrying or operation. The Cuisinart CGG 180T uses less durable materials on the joint locks and the foot pieces. These pieces can wear out and become less effective over time or with heavy use. Finally, the outer colors of the grill can scratch or break down by heat and time. This grill is designed to be used as free-standing or as a tabletop unit. The grill is compact and lightweight. It is easy to store, setup, and break down. The cooking surface remains under 30 inches with legs extended. Its lid may come off when the grill is being moved. This grill comes with plastic parts that could easily melt. There are online reviews that indicate the lid comes loose during carrying and storage. Some customers complained that the grill felt that it was built with flimsy materials. A handful of reviews indicated that the lid came undone while the unit was being carried or stored. The Cuisinart CGG 180T comes with a lid latch located at the front of the grill, above the dial. Taking the time to make sure the latch engages can prevent issues, as well as regular cleaning of the grill interior. There are also reviews that discuss the materials that the grill is made of. These suggest that such components were flimsy and thin. Users must keep in mind that a portable grill is designed to remain lightweight and include parts that break down quickly. Needless to say, Cuisinart designed these grills with convenience and ease of use as criteria. 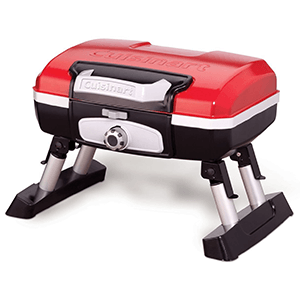 The Cuisinart CGG 180T is a highly portable propane grill that allows users to cook at almost any location. Its design offers an effective and quick grilling option for travelers. Do you have experience with the grill or suggestions for its use? We’d love to hear from you! This is a good portable grill to take camping or to the beach. It’s small and compact, making it easy to transport and use on the go. I’ve used a few portable grills in the past and this one is competitive with all the rest. Hey, Franco, appreciate your feedback! Hope this input will help others find their next portable grill.